Have you ever heard of "engagement season?" Well, apparently it's real. According to USAToday.com, engagement season starts at Thanksgiving and runs through Valentine's Day, with most proposals happening near Christmas and New Year's.If you think about it, it makes perfect sense - you're with family, you want parents to see the ring, etc. etc. Unfortunately, with only so many wedding venues available in the Cleveland area, there isn't much room for down time between the engagement and the wedding planning. That can be stressful even on the coolest of brides! Well, we want to make at least one part of planning easy on you - the cake! At The Hive Cake Studio, getting the perfect wedding cake is as easy as 1, 2, 3. 1. The first step is to schedule your wedding cake tasting. This is going to be one of the easiest parts of planning to get your groom to participate in. Call us and we'll set up a time that's convenient for you to come in to taste all of our most popular flavors. The only hard part will be choosing a favorite! 2. Find inspiration! 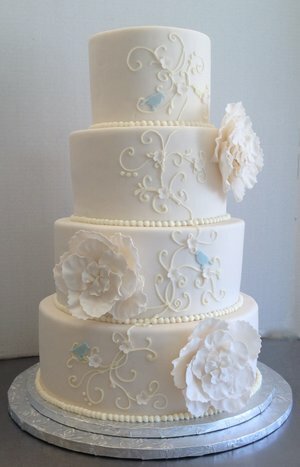 Whether you come in with a picture that you want replicated exactly for your big day, or simply have a color scheme and a general idea of style, our head baker is prepared to make your wedding cake visions come true. Newer PostHappy Thanksgiving, from The Hive! Older PostJoin us for a Holiday Open House!